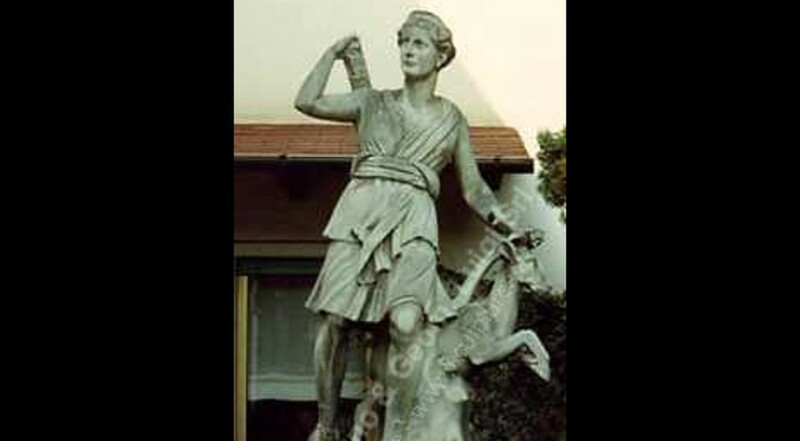 A large Diana statue, carved in Vicenza stone with deer sculpture (deer with bronze horns). Artemis was one of the most widely venerated of the Ancient Greek deities. Her Roman equivalent is Diana. Some scholars believe that the name and indeed the goddess herself was originally pre-Greek. Homer refers to her as Artemis Agrotera, Potnia Theron: "Artemis of the wildland, Mistress of Animals". In the classical period of Greek mythology, Artemis was often described as the daughter of Zeus and Leto, and the twin sister of Apollo. She was the Hellenic goddess of the hunt, wild animals, wilderness, childbirth, virginity and young girls, bringing and relieving disease in women; she often was depicted as a huntress carrying a bow and arrows. The deer and the cypress were sacred to her. In later Hellenistic times, she even assumed the ancient role of Eileithyia. Dimensions: Statue height 82 ½"; Base height 49"